Since I first nabbed myself a Playstation Vita, I have had many good experiences with games on it- others may not say the same thing however- and with Tearwaway, I can say I had a great one. Media Molecule, the British studio that brought us the wonderful world of Little Big Planet, has now made another universe worth investing in. This one is made of highly stylized papercrafts- an entire world created solely in origami. We get to play as with either Atoi (female), or Iota (male), a small and extremely customizable messenger tasked with delivering an important message. Even after completing the delivery, I'm still a bit fuzzy on both what and why the message was so important. ***SPOILER*** Especially confusing as it is the tale of the player and the character delivering the message itself, so how was it written in the first place? ***END SPOILER*** The game was more of an entertaining jaunt through a nicely realized world, than a goal oriented trek- making side quests and collectibles easy to obtain as I was in no hurry to finish. 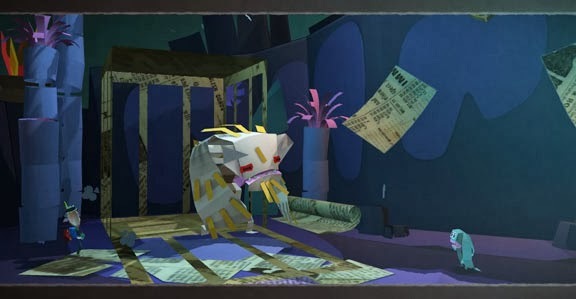 It should also be said that Tearaway is a game that breaks the 4th wall. Not just as part of the story, acknowledging the player (making you the sun), but as believable and consistent game mechanics. There are numerous ways of assisting your tiny paper character. From bouncing them higher by tapping the rear touchpad to "popping" your finger through the screen to defeat enemies- they all add just enough extra oomph to keep you tied into the fairly short narrative. All the 4th wall breaking is easily one of the best parts of the game, and at one point the game enters our world, and looks back into it's own. Intriguing use of the Vita's cameras. And unfortunately, because no game is perfect, I have to mention the two problems I personally had. First is the joystick controls. They are far too sensitive during the rolling sections on a later stage with very slim areas to make it by without falling off. While they work perfectly for all other aspects it was only with the rolling portions I noticed an odd difficulty. Second- and this is actually a problem with many other Vita games- the rear touchscreen. It is used for plenty of miscellaneous necessary controls for platforming and because I have adult hands they constantly touch the rear pad, which lead directly to many unwanted occurrences on screen. 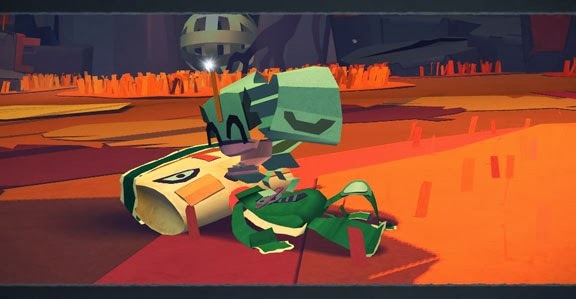 Tearaway is nowhere as revolutionary or vast as Little Big Planet, but it has a unique quirkiness that lends itself well to the Playstation Vita's slowly expanding library. A wonderfully concise game made better by being portable on the Vita. It isn't often we get games tailored so perfectly to a system, utilizing all the functions of the system in the game being played.